The circle skirt is one of those items that immediately brings to mind the decade in which it was popular - the 1950s. 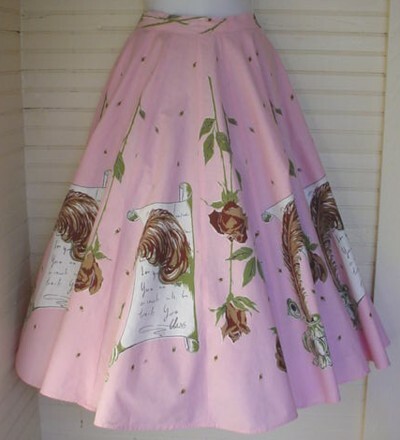 But the decorated circle skirt actually got its start in the late 1940s, with an actress-turned-designer named Juli Lynne Charlot. After WWII ended, skirts began to get fuller and longer. The dirndl, a lightly gathered style popular throughout the war gave way to skirts that were fully gathered or pleated. In 1947, Charlot designed some skirts for the Christmas holidays, made of a complete circle and decorated with felt appliques. A local store bought them, and they quickly sold out. For her next project, it was suggested that Charlot do a line featuring dogs. Among the dog skirts she designed was the poodle, and the rest is fashion history. The skirt was a huge hit, and soon it was being widely copied. Because the skirt was so easy to make, many were made at home by the wearer. The major pattern companies had a wide variety of designs, including the poodle, 45 rpm records, and decks of cards. The decorated circle skirt really caught on with the teenage set, and was pretty much a young and casual fashion. You are much more likely to see one featured in a 1950s Seventeen than in a Vogue of the same era. Many of them have decorations that reflect teen interests of the times, such as Rock & Roll themes. 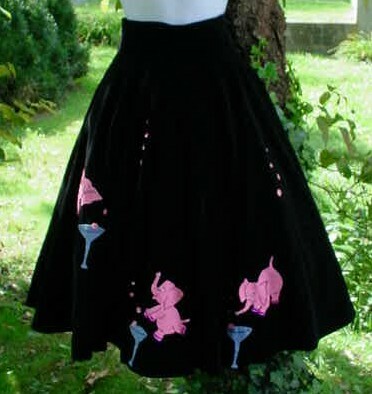 But not all of these great skirts were for kids, as they did sometimes feature mature motifs such as alcohol (see top illustration) and cigarettes. 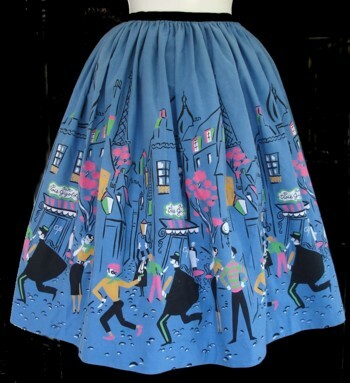 There were also novelty printed skirts that were similar in feel to the appliqued skirts, but they were lighter and more suited to warm weather. Border prints of exotic locales, circus themes, dog prints and Western scenes were among the many fabrics available to make full skirts. There was even special fabric with the skirt pieces printed on, and all the sewer had to do was cut the pieces out and sew them together - no pattern required. To see my collection of special printed travel themed skirts, vist Novelty Print Skirts . Home sewers could buy fabric that had the design and pattern preprinted on it. This one features a love letter from "Elvis!" Some of the most spectacular circle skirts of the 1950s came from Mexico. These were made primarily for the tourist trade, but they were also imported into the United states and sold through catalogs and mail order. Many were hand painted or block printed, and then they were lavishly decorated with sequins. Most had scenes of sterotypical Mexican life, but others had large colorful flowers, or scenes of the desert. 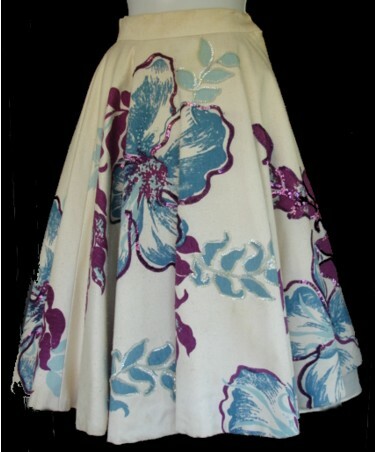 These skirts continue to be very popular with collectors today. California Casual. Atglen, PA: Schiffer Publishing Ltd., 2001. Copyright © 2005 -2010 Lizzie Adams Bramlett. All Rights Reserved.